So far, I’ve been testing air purifiers by taking a baseline measurement of particulate pollution in a room, and then turning on the purifier and testing whether the counts drop. I’ve used that method to test the DIY and more expensive machines. However, I recently bought a second particle counter, so my collaborator Gus suggested another method: run one particle counter in the bedroom that has the purifier, and run another particle counter in a different room that does NOT have a purifier. The benefit of this method is that the control room represents the counterfactual–what would have happened if we hadn’t turned on the air purifier. Thus, if a northwest wind hits Beijing and makes the outdoor air a lot cleaner, we can separate the effect of the outdoor air fluctuations from the effect of the purifier. In that situation, my old method would artificially raise our estimates of effectiveness. 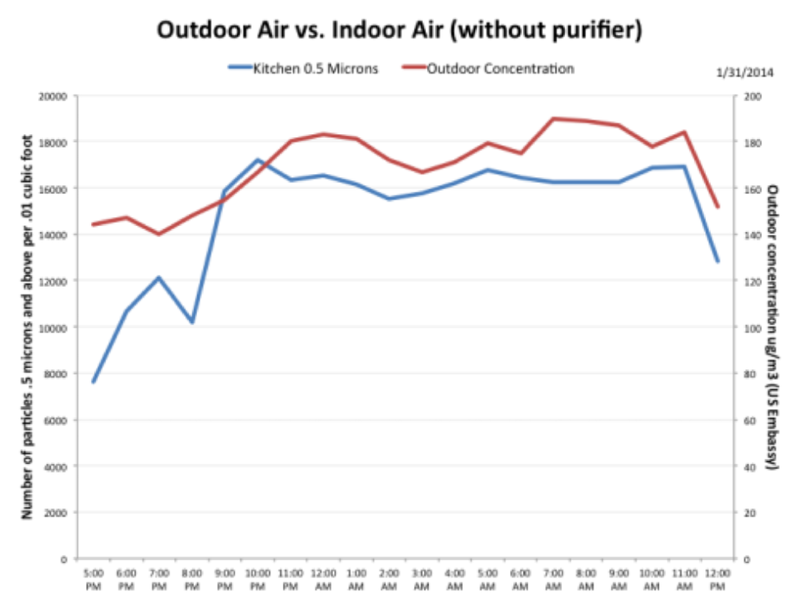 Changes in outdoor air can also artificially lower our estimates of effectiveness if the outdoor air gets dirtier after we turn on the purifier. In previous tests, I corrected for this by averaging over multiple tests. I also analyzed the data after removing days in which outdoor air pollution fluctuated a lot (for example, I do that sort of analysis in the extra nerd notes here). The difference between the bedroom and the kitchen air quality can approximate the effect of the air purifier. It looks like Gus would have been breathing 16,000 of these 0.5 micron particles in the air in his bedroom if he hadn’t turned on his DIY purifier. 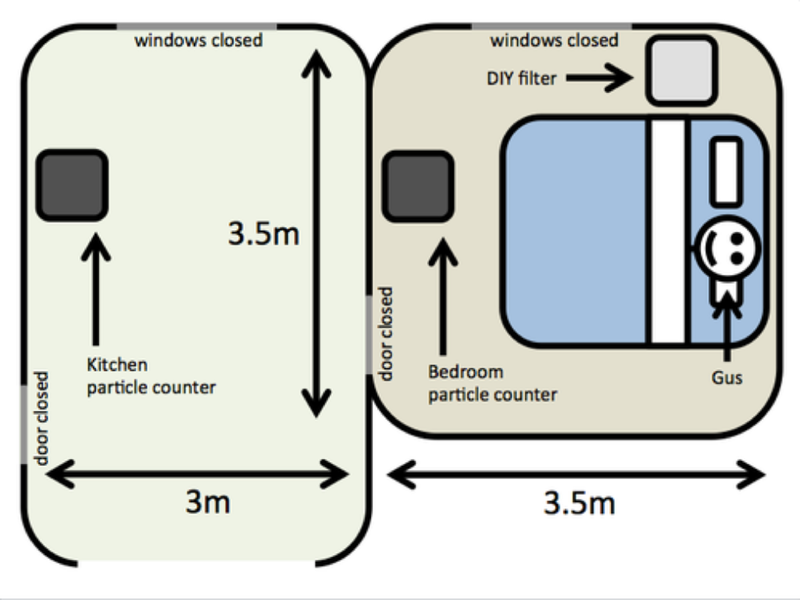 Conclusion: Similar to earlier tests, the double particle counter test shows that the DIY purifier is removing particulate pollution from the air. As always, I’m including more details for fellow data nerds below. Remember that because these particles are larger, they are more affected by people moving around. That’s probably why there are large spikes from 7 to 9pm, and why counts level off after midnight. However, even after the numbers level off, the purifier is reducing the counts in bedroom even further. Therefore, we cannot guarantee the kitchen and bedroom numbers are taken at the exact same time. However, after the fact, we can tell when the measurements were taken. Thus, we know that the bedroom numbers were taken at 27 minutes past every hour, and the kitchen numbers were taken at 36 minutes past the hour. Those numbers are reflected on the X-axis. Percentage effectiveness: I also computed the percentage reductions in particulates using my regular method of averaging the last four hours before the DIY was turned off. 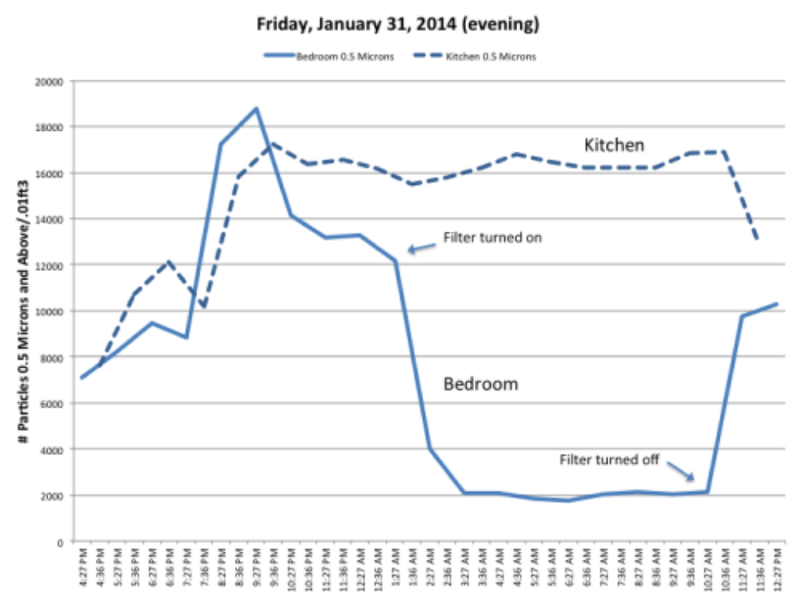 Then I compared that as a percentage of particulate in the kitchen. 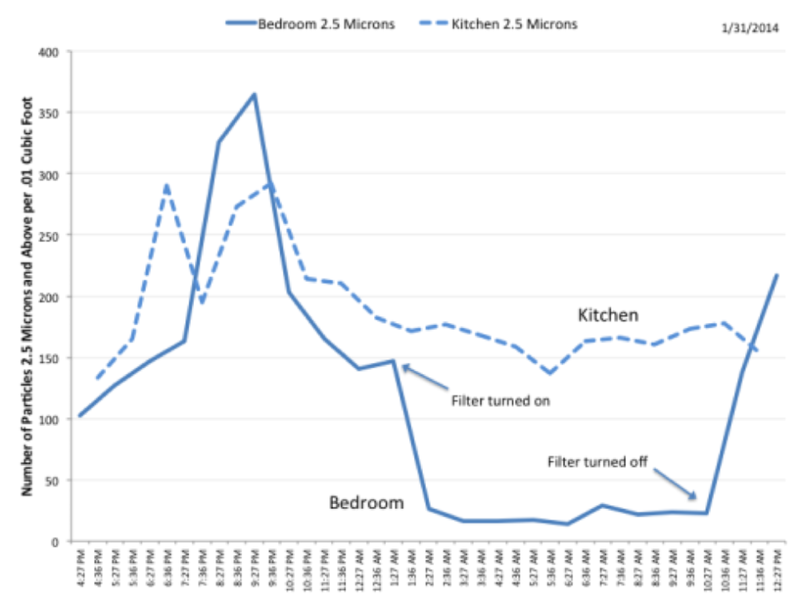 According to that calculation, the DIY removed 86% of 2.5 micron particles and 87% of 0.5 micron particles. Compare that to 92% of 2.5 micron particles and 84% of 0.5 micron particles in my earlier tests. However, I am cautious about drawing strong conclusions from one day’s data. It would be best to average the results of several testing days.